Margin is “The space that once existed between ourselves and our limits.” When we reach the limits of our resources and abilities, we are out of margin. 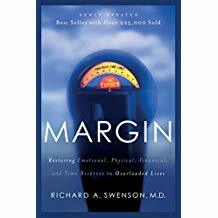 A review of a very important book by Dr. Richard Swenson, Margin: How to Create the Emotional, Physical, Financial, and Time Reserves You Need. In this article we are looking at a very important book by Richard A. Swenson, a medical doctor. The book is Margin: How to Create the Emotional, Physical, Financial, and Time Reserves You Need. Dr. Swenson’s thesis is that though scientific progress benefits us in numerous ways, it also brings with it inevitable pains that must be ruthlessly resisted if one is to live a balanced life, and especially a life that reflects Christian values/virtues. Margin is “the space that once existed between ourselves and our limits.” When we reach the limits of our resources and abilities, we are out of margin. Progress, contrary to our expectations, is like Pacman; it incessantly eats up margin. Progress and margin are often opposing forces. The author recognizes the pains of the past and acknowledges that life for previous generations was no picnic. Nevertheless, he amply illustrates the staggering number of challenges facing contemporary mankind, challenges that have no precedent in human history. The pace of modern life has been steamrolled by progress. Many have resisted the notion that life in the waning years of the 20th century was unusually painful and stressful. After all, didn’t our history teach us of those intrepid men and women who crossed oceans and braved the harsh winters of the new world to have personal and religious freedom? Shouldn’t we be ashamed to complain about the stress in our lives when brave pioneer men, and their even braver wives, piled their children and all their belongings into covered wagons and headed west across unknown and unforgiving lands surrounded by potentially hostile Indians? Did not our fathers win World War II? After 50 years of strife and struggle and staring eyeball to eyeball with Russia, didn’t America finally face down the threat of world dominion by implacable, godless communism? Where then do we get off saying that life today is hard and stressful? As Swenson clearly points out, without minimizing the horrors of the past, modern progress brings problems never before faced by mankind. Some of our problems are very different from those of the past perhaps, but they are real, formidable problems just the same. For example, a partial list of problems would include the speed of travel, the power of computers, levels of litigation, pervasiveness of the media, specialization, business layoffs, indebtedness, vulnerability to terrorism, spiraling medical costs, AIDS, numbers of teen mothers and illegitimate births, aging population, overcrowded prisons, environmental pollution, overcrowding, traffic congestion, prevalence of divorce, disintegration of the family, drugs, prevalence of sexual diseases, complexity at all levels, and on and on the list could go. Never before have we had to face problems of this — and certainly we have never before had to face them all at the same time. In his book Margin, Dr. Swenson says that our problems have no precedent because of the rate of change. In the past we faced a slightly upward pattern of linear change; now we are looking at a skyrocketing pattern of exponential change in practically every area of life. Yet most of us still think and live with a linear mind-set. Suddenly we are encountering limits in our time, energy, health, finances, ability to concentrate, to care, to even feel. Minds, bodies, systems, plans that were adequate on a linear timescale may self-destruct at warp speed. We are perilously close to burnout. We hope beyond hope that things will level out and slow down, but even if that happens, much that makes life worthwhile and manageable will be destroyed in the meantime. Examples abound of life without natural boundaries. Once it was a given that the night was for sleeping, and the day was for work. Now a hundred years after the electric light bulb, whole cities never sleep. Sunday was once a day of rest; nearly everyone had one day off from work. Now the boundaries between work and play and home and the office are so confused some people can never relax or let down. A few years back we might have known someone who had borne a child out of wedlock, been divorced, had emotional problems, or gone bankrupt, but today we are in an epidemic of such problems. It is critical to note here that progress has brought man much power– power that can be used for good or for evil. The sobering truth, then, is that the power to do evil advances exponentially, and modern secular man is not known for restraint nor does he recognize his fallenness and the danger it holds for himself and all humanity. We have benefited from progress in two main areas. First, we have seen positive gains in medicine, technology, and in our standard of living and material well being. Second, our intellectual and educational opportunities have expanded enormously, and knowledge and information are increasing with unimagined speed. The pain that progress has brought us is evident in three areas. First, we have lost ground in the social sphere as pressures have increased on all relationships: family, friendships, neighborhoods, community spirit, and church life. Second, we are often emotionally drained, stressed, angry, isolated, and frequently unfulfilled and don’t know what to do about these problems. Third, we are spiritually weakened by the pace of life, the lack of community, lack of time and energy to cultivate our relationship with God and with our fellow man. This, Dr. Swenson says, is the price we have paid for progress. Because of the unprecedented level of problems today people live with very high levels of stress. Stress is “the nonspecific response of the body to any demand made upon it.” Note that stress is not the circumstance but the response to the circumstance. We normally think of such a crisis as the “fight or flight” reaction which pumps adrenaline into our system, makes us stronger and more alert, etc. If these responses are occasional there is little harm done, but if triggered too often or if “stuck” in a constant state of anger, rage, anxiety, fear, or frustration, we begin to overdose on our own adrenaline. This can bring about irreversible damage to the body and set it up for heart attack, stroke, cancer, etc. Our stress levels are unprecedented. One reason is that most of us today experience constant mental strain without the offsetting benefits of strenuous physical work. When, for example, the commercial property deal we’ve worked on for months falls through, or the accounts don’t balance, or the computer just won’t cooperate, there is no place to run and no one to hit. We just have to try again. The physical laborer, even if he has some mental strain, still has the labor to drain off his adrenaline, and he usually has the ability to think about other things occasionally as he works. The facts are that there are physical limits and man has performance limits, emotional limits, and mental limits. The work load a twenty-five year old athletic, single man can carry may differ greatly from the load a fifty-five year old man can carry if the latter has two teenage children and two children in college, dependent parents, and a wife in menopause. When such overload occurs, the person may experience anxiety, have a physical or nervous breakdown, exhibit hostility, slip into depression, or become bitter and resentful. We are overloaded with activities, change, choices, commitments, competition, debt, decisions, education, expectations, fatigue, hurry, information, media, ministry, noise, people, pollution, possessions, problems, technology, traffic, waste, and work. So why do we overload? First, we are usually unaware of our overload until it’s too late. Second, some people are too conscientious. Third, others get overloaded because their bosses are driven people who overload their employees. Generally people don’t intend to go down the path to overload; they just think that “one more thing won’t hurt.” But if they are at or near overload, it will hurt. As the author says, learning “to accept the finality and non- negotiability of the twenty-four hour day” will help us avoid overload and excessive stress. Of all the areas in which we need margin, having adequate emotional energy is the most important because with emotional margin one can work to gain the other margins. The amount of emotional energy we have is finite and must not be squandered. Though it is difficult to measure and quantify we must not be embarrassed to admit to ourselves or to others when our emotional reservoir is low. Then we need to replenish our emotional reserves for the good of others and ourselves. Restoring emotional margin is aided by cultivating our social and family support network. Serving others or doing volunteer work is proven to enhance and lengthen life. Extending forgiveness and reconciling relationships can stop the negative drain on our emotional stores. Cultivating a spirit of gratitude, a hopeful outlook, and love for God and our fellow human beings is energizing, whereas their opposites are negative and debilitating. Finally, establishing appropriate limits and boundaries will help in maintaining emotional reserves. Dr. Swenson’s recommendations for gaining a margin in physical energy are fairly routine to the knowledgeable reader, but he puts particular stress on the need for the need for rest and sleep. The need for correction is clear since America has now become a 24-hour society: many of our cities never sleep and many businesses never close. People of all types, college students, policemen, nurses, taxi drivers, shift workers, and mothers of young children, may go long periods without a good night’s sleep. Such people push (or are pushed) to their limits during the day and push on into or through the night. Sleep disorders plague more than 50 million of us; in fact, sleep deprivation “has become one of the most pervasive problems facing the U.S.” Unfortunately the ability to go without sleep is sometimes a matter of pride for some, but sleep and rest are God’s ideas, and we should not be ashamed of our need for both. The author gives several helpful suggestions on making sleep more natural and effective. Dr. Swenson strongly stresses the need for all types of physical exercise, but says that aerobic exercise for the heart “will do more to establish margin in physical energy” than anything else. He endorses exercise not only for its physical benefits but also for its emotional and mental benefits. Clearly time becomes a problem for a society like ours. Some the author’s suggestions for countering the time crunch are countercultural and tough to implement, but then continuing on in the same direction most of us are going is difficult as well. He suggests practicing saying “No,” turning off the television, practicing simplicity, and getting less done but doing the right things. Many of us need to make some thoughtful and hard choices. The author’s suggestions for gaining a margin in time are preceded with a reminder that of the ten top stressors of family life, four have to do with insufficient time: insufficient couple time, “me” time, family play time, and overscheduled family calendars. Why do we need to prune our time wasters? Because time is for people and relationships, subjects very dear to God. At some point, all things being equal, we would become quite accomplished in a given area. The end result, however, might be similar to having one magnificiently developed right arm attached to puny, stooped shoulders, a scrawny left arm, and skinny, weak legs. This is like the person who is a powerhouse in his professional life and a dwarf in his relationships. Dr. Richard Swenson suggests a different way in his book Margin. He suggests an approach to life that neglects no important area. He suggests being willing to sacrifice excellence in one or two areas in order that no area be in a condition of negative excellence. This would be similar to the athlete who is toned and conditioned all over, but not overly developed in any one area. A similar balance in our lives will increase our emotional margin because we and and our families will be happier. Simplicity has much to offer harried twentieth-century man. But it isn’t easy. It takes effort to discard the superfluous and concentrate on the core elements of life. There has always been an attraction to simplicity; the difficulty has been in achieving it. The simple life the author calls us to is not so much to escape modern life as to transcend it. Envy is the enemy of contentment and form of self-inflicted torture. Yet because envy is the chief ingredient of advertising and the mainspring of political and social movements, it is difficult for many to see its destructiveness. We need to follow Paul who learned contentment in whatever circumstance he found himself (Phil. 4:11-12; 1 Tim. 6:6-10). The practice of contentment brings margin into our lives. The pain that progress has brought us is mostly in the area of our emotions, our relationships, and our spiritual natures. What are some additional steps start dealing with the pain and achieving some margin? First, thank God for the pain. The pain pointed out that something is wrong. Second, repent in a way that leads to permanent, tangible change. Third, prune activities and habits that waste time, sap energy, and stifle relationships. Fourth, cooperate with God. Bathe plans in prayer and leave wiggle room for yourself, your family, and people God may send your way. • How did we relate to God? • How did we relate to ourselves? • How did we relate to others? The road to health and blessing in the path of relationship. Love and relationships are hard work, and sometimes costly because superfluous, unimportant things may need to be put aside, but the payoff is happiness, contentment, peace, and margin. I hope some of the things we have shared in this article turn you from the path of overload and start you down the path of margin. Louis D. Whitworth is the former senior editor at Probe Ministries. He is a graduate of Northeast Louisiana University (B.A., Sociology and English, and M.A., English) and Dallas Theological Seminary (Th.M., Pastoral Theology). Prior to joining Probe, Lou taught English literature and composition at the college level and served with Campus Crusade for Christ in the Military Ministry as well as the Singles Ministry. 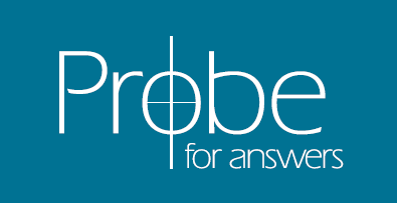 He is the author of the Probe booklet, Literature Under the Microscope: A Christian Look at Reading.